Even though the weather doesn't seem to realize we should slowly be creeping towards warmer temperatures and fewer layers, the heroic businesses of Jersey City do and there are lots of events over the next several days to get you out of your apartment and enjoy! First off, today Barcade is celebrating NYC Craft Beer Week Jersey-style with the 2nd Annual Bridge and Tunnel Night! They will be featuring craft-brewed beers that you can't get in New York, beginning at 12pm. Tomorrow at 10:30am, WORD will have their Grand Opening/Ribbon Cutting Ceremony and will be giving out free cups of Stumptown coffee in celebration. It's a great time to check it out if you haven't already. 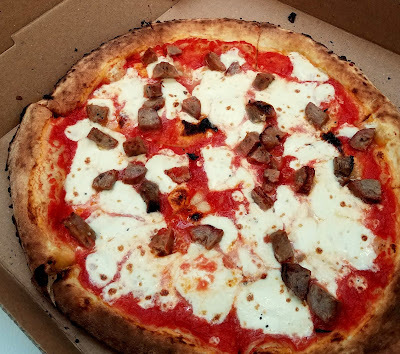 Jersey City is packed full of pizza places and casual Italian dining spots, so when I started categorizing some of my personal favorite delivery options, I found that I really needed a whole separate list just to cover them. Especially because I, with my very particular tastes, tend to only order certain things from certain places - no one size fits all here. So - here you have it, Delivery Spots Part II: All About the Italian. Congratulations to ModCup on the Grand Opening of their cafe in Jersey City Heights this weekend! They are offering their fantastic coffee of course, as well as tea from Do You Tea and baked goods from Cocoa Bakery and All Kinds of Whoopie. They will be open all next week from 7am-5pm. The date for the 5th Annual Hamilton Park BBQ Festival has been announced. It will be held on Saturday, September 27th and will run from noon-8pm. If last year was any indication, you don't want to miss it! Congratulations to Jersey City Veggie Burgers whose Kiva Zip loan was officially funded last week! Liberty Humane Society is hosting their 4th Annual Wine Tasting at VB3 next Sunday, March 2nd from 5pm-7pm. For a $35 donation, there will be wine, antipasti, pizza and all benefits will proceed LHS. Check Seen in Jersey City's post for more info on the event and on current adoptions. More congratulations go to Thirsty Quaker. After much hard work and waiting, they will officially open this Tuesday, Feb. 25th for all your local brewing and beer needs! Third & Vine Now Open! Last weekend, Third & Vine, a wine and cheese bar that also carries small plates, quietly opened up in the Village section of Jersey City. I went to check it out within the first few days and while I'll hold off on posting any real reviews until they've been open a bit longer and I've had the chance to try more, I did want to at least let you all know this place is up and running and share some pictures. I have an unfortunate tendency to become something of a hermit in winter. And man, have we had a lot of winter this year. So while I will probably not have any friends left by the end of this season, I have developed a pretty good knowledge of delivery options available in Jersey City. Below are some of my favorites (this is not an exhaustive list, but places I find myself ordering from most frequently). You will note that none of them are Italian/pizza places - don't worry, they'll get their own post. Consider this Part I. This Wednesday, 2/19, join See Spot Rescued at Park and Sixth Gastropub for their Hair of the Dog Fundraiser. There will be happy hour specials and a raffle for prizes including gift certificates to local vendors like Milk Sugar Love, Left Bank Burger Bar, Rustique, as well as training sessions, a photo session and more! Stop by to enjoy some drinks and help a good cause. Congratulations to Hamilton Inn who has been named a 2014 OpenTable Diners' Choice Award winner! On Saturday, March 1st, the Historic Paulus Hook Association will be holding a Casino Night fundraiser at Base with prizes including gift certificates to local businesses including Satis Bistro, Light Horse Tavern, and more! You can purchase tickets here. They have non-gambling ticket options available as well for those who just want to enjoy the party. So Pax has been hitting Jersey City pretty hard and with the bad weather supposed to continue through the night, you might be wondering where you nourish yourself and/or quench your thirst around Jersey City. Well, lucky for you, I've put together a list so you don't have to do that work! I'll keep updating as I find out more information and if you know of anyplace opened or closed, please feel to pass it along via FB, Twitter, or just by leaving a comment below! Thanks to those of you who have helped so far, especially The Critique East and stay safe and warm out there! Barcade - Beyond a Liquid Lunch! I really like beer. I also really like sandwiches. So not too long ago, when Barcade made some changes to their menu and began running a lunch special of any sandwich, $6 beer, and pretzels for $10, I was pretty excited. The options include both hot and cold sandwiches including a veggie burger and a couple of grilled cheeses that are vegetarian-friendly (nothing specifically vegan) and there are about ten options in all. One of the most extreme of these options is the waffle sandwich - your choice of either maple-mustard chicken or all-natural pork sausage (or both for a $2 supplement) with american cheese between two waffles which sounds intense but delicious. 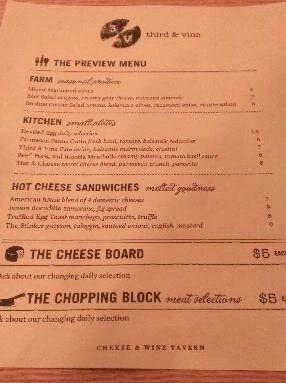 While I definitely considered getting it, I decided to keep things a little simpler and go for the Fancy Lad grilled cheese - and yes, I chose it because of the name. Also ordered were the regular grilled cheese and the Mac and Cheese with pulled pork (another intense but delicious one). La Conguita has updated their menus including some great lunch specials and more excellent deals for Happy Hour! They've also done a major overhaul of their wine list so go check it out! Sam a.m. is also becoming Sam p.m. with the formation of a new supper club. The supper club will be prix-fixe and by reservation only, but the inaugral menu looked delicious. Sugartown Bakery & Cafe will be having their Grand Opening next Sunday, Feb 16th. Stop by to congratulate them and enjoy something delicious - they carry everything from cupcakes to quiche. Orale has changed up their dinner menu, simplifying it but keeping many of their same favorite dishes with a couple of new items to help you branch out. Check out this review from Devil Gourmet about Zeppelin Hall - the Hindenburger seems to be a big winner! While I personally am of the opinion that you should engage in good drinks and good food as often as humanly possible, regardless of your romantic situation, Valentine's Day is well-known as a day for delicious indulgence, so why not enjoy it? There are plenty of options around Jersey City to help you out. First up, a pre-Valentine social event for both singles and couples next Tuesday, Feb 11th! Hosted by Garden State Food Tours and held in the cozy and creative atmosphere of LITM, this event promises you two custom cocktail creations from LITM as well as some decadent desserts from All Kinds of Whoopie and Milk Sugar Love for $35/person. In addition, LITM will be running some other drinks specials that evening so you can keep the fun going and maybe make some new friends with a little liquid courage! As a date or just a nice evening out, this event will be sure to put you into the Valentine's Day spirit. More information and tickets are available here. Tea NJ Comes To Jersey City! On Saturday, Tea NJ held their soft opening, and while they started a little late, they quickly had a full house. Located at 262 Newark Avenue by Monmouth in the Village, next to Tachair Bookshoppe, the space is intimate but with room for about 10 tables and the counter. It's got a cozy, relaxed feel with an eclectic collection of art, figurines, and other decor placed all around the store including an art wall where Jersey City artists will be welcome to post their work for free. Walking in, we were told to pick anywhere we wanted to sit down and menus were brought over to us while drinks to go were being ordered at the counter. 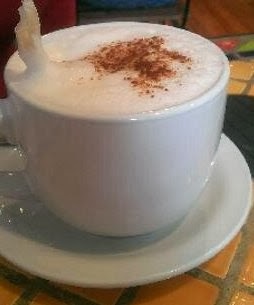 The tea list is extensive, listing green, black, oolong, white, and many more as well as specialty beverages including tea ciders, bubble tea, different tea lattes and a number of coffee drinks with coffee from Red House Roasters in Union City. Each of the teas listed comes with a caffeine rating and a thorough description to help guide your decision and they offer a variety of milks and sweeteners so this is about as personalized as it gets. Congratulations to Emma of Milk Sugar Love who is moving into 19 McWilliams Place by Hamilton Park! She's hoping to be open and operational by May. Congratulations also to Tea NJ who held their pre-opening this Saturday and got a full house! Where to Watch Super Bowl XLVII 2014 in Jersey City! It's finally here. Super Bowl 2014, Colts vs. Seahawks at Metlife Stadium only a few miles away from our own Jersey City! Now, as I presume most of us who actually live here will not be attending, there are some important matters at hand...like where to watch.